The Abilene Basketball Teams Complete Season Sweep of Wamego! 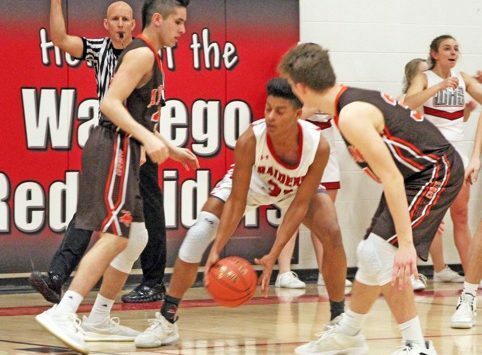 The Abilene High School basketball teams completed the season sweep of Wamego on the road Friday night but it was far from easy. The Cowgirls held on for a 45-42 lead after they had surrendered a 12 point second half lead. The Cowboys watched a 14 point third quarter lead get trimmed to 4 in the fourth in their 54-44 victory. The Cowgirls game was similar to their first meeting between the two teams. Abilene won 42-41 on January 8th. In that game the Cowgirls led by 13 points in the first half. Friday night Abilene led 9-6 after 1 quarter, 21-13 at halftime and 32-22 after three quarters. In the fourth quarter Junior, Jade Vopat scored to give Abilene a 34-24 lead with 6:14 to play. Wamego would then come to life, the Lady Red Raiders went on a 15-2 run to take the lead 39-36. It would be their first lead of the game and they got it on a basket by Junior, Maci Beachler and a free-throw by Freshman, Paige Donnelly with around 2 minutes to play. Wamego would take their last lead on a free-throw by Junior, Aubri Alexander with :57.4 seconds left. She was fouled by Abilene Senior, Sydney Burton, who fouled out of the game with 18 points. Alexander hit 1 of 2 free-throws to give Wamego a 42-41 advantage. The Cowgirl’s other Senior, Hannah Willey would take over, she connected on 4 straight free throws to give Abilene the 3 point win. Willey also finished with 18 points and was 10-10 at the line and 6-6 in the 4th quarter. The Cowgirls improved to 14-2, 8-0 in the NCKL and clinched a share of the league title. Abilene was aided by Marysville. The Clay Center Lady Tigers lost at home to Marysville 62-39. It was Clay Center’s second league loss of the season. The Wamego girls fell to 10-7, 3-4 with the loss and had their 3 game winning streak snapped. The Cowboy’s had to wait for TJ Fritz to cool off before they got control of the game. The Wamego Senior scored all 13 of his team’s points in the first quarter. He would finish the game with 18 points. Abilene led 14-13 after one quarter of play. The Cowboys closed the first half on a 13-2 run to take a 27-20 lead into the half. In the 3rd quarter Abilene got up by as many as 14 points and would take a 40-30 lead into the final quarter. Wamego got to within 4 points at 44-40 with 4:56 on a basket by Junior, Taybor Vetter but that’s as close as they would get the rest of the way. Abilene was led by Freshman Kaleb Becker with 11 points and also got double-figures from Senior, Tim Barbieri, who finished with 10. Abilene improved to 13-3, 7-1 with the victory and took sole possession of first place in the NCKL with Chapman’s 55-50 loss at Concordia. Wamego fell to 6-11, 1-6 after the loss. Abilene will return home Tuesday against Hays.